Bridesmaid Gowns – Long or Short? 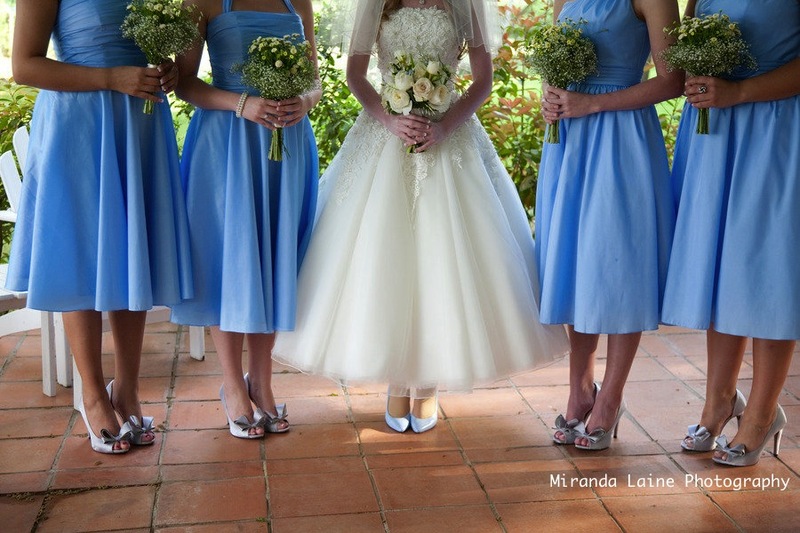 What dictates the length of the bridesmaid dress? It’s not the time of day or theme of the wedding, or the cost of the event… it is actually way more complicated than that. Them most important thing to consider when selecting the gown is ….the fabric! Although the length is a contributing factor, think about how a long, cotton gown will not go nearly as well at a black tie evening event as a short, satin, embellished mini dress. A long, heavy satin gown will be overwhelming at a summer daytime event whereas a gauzy, chiffon gown might be freezing at a mid-winter reception. Long dresses – For a black tie wedding, long is almost always the best choice. These type of wedding are usually evening events where the dress code is formal. Long dresses are also appropriate for a black tie optional or semi formal event but, can be worn for any wedding any time of day if you prefer. Be careful, long dresses can be overwhelming for an outdoor wedding on a hot summer day…choose the right fabric! Tea- length – The length designated as anything from mid-calf to the ankle can be worn for any type of event other than formal. Daytime, afternoon, evening, beach, tea length gowns can go anywhere and are the most versatile choice for bridesmaids, depending upon the fabric! Short – Slightly above, below or right at the bend of the knee. If you don’t want the bridesmaids to wear pantyhose, make sure the weather is suited for bare legs or you will have some bridesmaids with goosebumps. The right short gown can be perfect for a semi-formal or even a formal event, and the wrong gown will look horribly out of place so, keep in mind that the fabric and style will make a huge difference. The perfect fabric, length, color, and style will all add up to the right combination that works for your wedding. Long gone are the days that bridesmaid gowns are frothy, tacky or downright drab. It used to be impossible to find anything fashionable and that whole “You can wear it again” was unimaginable. The worst part was that trying to find something that looked good on everyone, almost assured that it looked good on not one of them! The designers and trendsetters heard the cries of the collective masses and as a result, attendants today have many choices. Wait until you see what they have in store for Spring 2011. Lets take a look at whats hot in bridesmaid attire! Halter Necklines – A Halter top is defined by a single strap that goes around the neck and offers support. Some Halter styles can be worn with a bra so you have added comfort. When fitting halter top, the strap should be just snug enough to hold the gown top properly in place but not so tight as to leave a mark on the skin. They can tie, hook or be one solid piece of fabric, it doesn’t matter. There are a lot of different halter necklines – pick the one you are the most comfortable with. Tea Length Dresses – This style took over in the late 1980’s when bridesmaid gowns began to be more fashionable and wearable. The key word is began, it took well into the 90’s to perfect the tea length look. Tea length is defined as any hemline below the knee and above the ankle. Preferably lower calf, 10-14″ from the floor. This is the perfect look for an afternoon wedding. One Shoulder – A very dramatic effect that looked so great on Princes Diana she wore this style often. Most notably wearing Versace on the cover of Vanity Fair in 1997. Draped, tied or embellished with a brooch or flower, a one-shouldered gown is sure to turn heads. This style will look good on more figure types than any other neckline style and in floor length is an excellent choice for a formal wedding. Fabric that moves, that flows and almost has its own personality. Fabric can make or break the style of a gown, using the wrong fabric can be a cardinal sin. Fabric, when chosen carefully, is it’s own distinct style element. This year’s biggest, hottest trend is beautifully draped or flowing chiffon, smooth charmeuse as soft as butter, anything that moves or flows. The most figure flattering fabrics, there is a reason why they are so popular right now. Short or long; any time of day or night – a flowing chiffon, jersey or charmeuse gown will be flattering to most figures a pleasure for the bridesmaid’s to wear. Click on the link below to see our couture runway fashion show where we feature the hottest styles in bridal and bridesmaids gowns. Then, call 847-428-3320 to get tickets to a show in your area so you can experience the fashion firsthand.